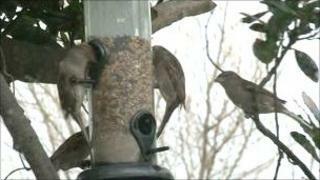 Bad weather in the UK could have driven thousands more birds than usual to Jersey this winter. Bird watchers at the Societe Jersiaise have said there are far more birds here than normal. While Jersey has had snow in recent weeks, it has still been much warmer than most of the UK. The Societe believes the freezing conditions have forced thousands of birds which would usually be on the mainland to come to the island. Chairman of the ornithological section, Mick Dryden, said Jersey has far more food available, because the ground was not frozen. There are more than 20 conservation fields in the island, where farmers have sown seeds such as sunflower and kale to feed birds. Mr Dryden said these fields have been invaluable in helping the extra birds which have come this winter.